The one-sheet for Ti West's THE SACRAMENT is purdy, but super-revealing! 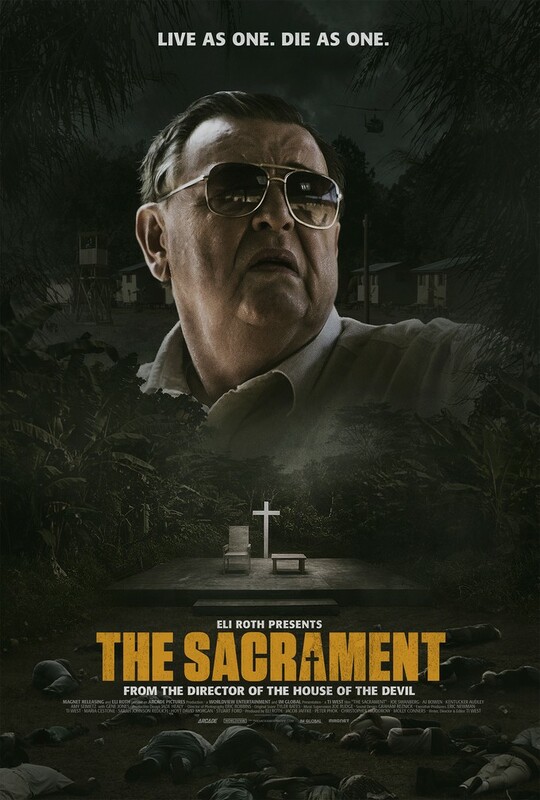 One of the best times I've had at a theater recently was when I caught Ti West's THE SACRAMENT at the AFI Film Festival back in November. Knowing nothing about the film, aside from West's excellent repertoire (including HOUSE OF THE DEVIL and THE INNKEEPERS), I had an amazing time sitting in the theater and figuring out just what it was that I was watching. Like his two previous features, West's SACRAMENT has a slow build, and it's easily the least horror-y of his output so far. When the proverbial fit hit the shan, narratively speaking, I was simultaneously giddy and dumbstruck, and I was able to connect to what I was watching on a very deep and palpable level (how many recent genre movies can you truly say that about?). So when I saw the above poster that IGN premiered today, I was super-bummed at how spoiler-y it is. The tagline, the imagery, and even the character in the illustration all give away (or, at the very least, seriously hint at) elements that aren't revealed in the film until the second half of the narrative. Now, I can acknowledge that this film's a hard sell, and it doesn't have the name actors or the superficial "thrills" or "scares" that would make marketing a cake-walk, but giving away the flick's secrets right there in the poster seems like Magnet (and West, if he was involved in this) may be shooting themselves in the foot. Without that slow, creeping realization of where the plot is heading, I don't know if the full effect of the film will be achieved on savvy, cynical audiences. But hey, I've seen the film, so I immediately know what all this is alluding to. There's a good chance that millions of people could see this one-sheet and still have no idea what's in store for them when they actually see West's product. Plus, I like the poster design on a superficial level, particularly the illustration of Gene Jones' "Father". I just can't help but wish that this was some sort of after-the-fact art for the DVD release or something, created after the movie had been seen and embraced by West's fans, once audiences had had a chance to see the movie for themselves. But as a fellow AICNer pointed out to me, "they're making the decision - they're comfortable with it out," so what the hell do I know. It's a great flick, so whatever they need to do, I hope they win all the money. THE SACRAMENT will be performed on VOD on May 1, and in theaters on June 6th.